The author’s 2017 Specialized Enduro with new Fox Float X2 ready for the maiden voyage. Fox has added a Float X2 shock that is compatible with 2017 Specialized Enduro frames to its line-up. This adds a high-performance damping option for riders, offering increased tunability and a climb switch. When Specialized released the 2017 Enduro frame with identical shock dimensions as the previous generation, many riders believed their existing shock would be compatible. That turned out to not be the case because Specialized flipped the MANFU orientation for 2017 (the u-shaped part connecting the shock to the linkage), so the air port on existing X2 shocks contacted the frame during full squish. The linkage interface is directional, so it cannot be flipped. But it looks like this update will add strength to the link. Also eyelet spacing is reduced from the previous generation frame, but that’s an easier fix. The 2016 Fox Float X2 (left) vs. 2017 (right) air can key. The retention screw on the 2017 offers great additional safety. For 2017, Fox made a few updates to the X2 to address issues some riders experienced with the first generation shock. The air sleeve now has a small screw to prevent unintended rotation. It also has a spacer limiter and updated volume reducers, which are now two-piece plastic clips instead of rubber rings. These are what is installed during the X2 warranty recall as well. Finally, the Fox X2 shock now ships with a compact 3mm/6mm hex adjuster tool. 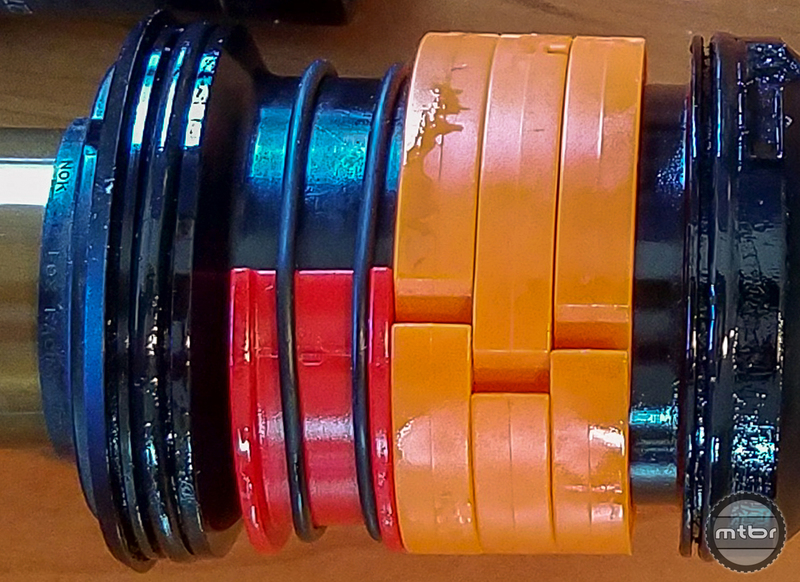 The Fox Float X2 volume spacers (orange) and spacer limiter (red). The 2017 Enduro-specific Float X2’s shock shaft is flipped 180 degrees (the keyhole rotated) to align with the MANFU bolt, while the air can is unchanged. Also eyelet spacing is reduced from the previous Enduro frame, so a bushing kit might be required. Part number is listed below. The shock we received had the pre-2017 eyelet bushings, so make sure to check. There is room for a maximum of 3 volume reducers fit, plus the spacer limiter. When purchasing my 2017 Enduro frame, I had the X2 in mind. Then I found the incompatibilities mentioned earlier and have been anxiously awaiting an update. It arrived and works great. Many people wonder why I’d want to swap out the stock shock. After all, the Ohlins STX22 performs well, looks amazing, and Ohlins has a stellar reputation. 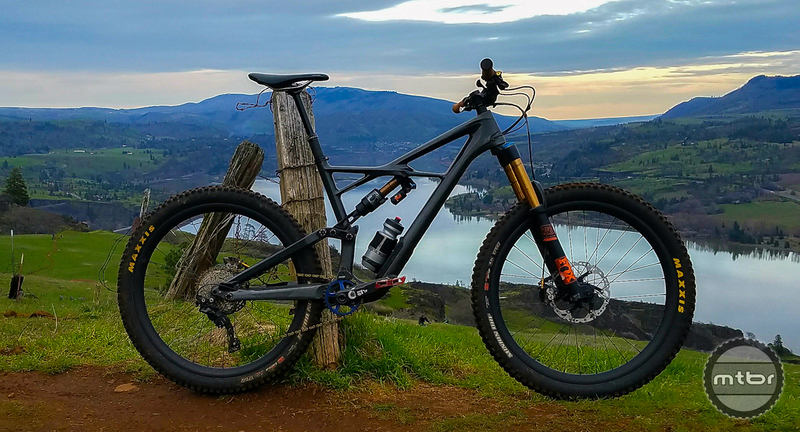 Yet, when riding the Enduro with STX22, I found the suspension to either push through the travel too easily or it felt overly harsh on small bumps (after increasing spring rate and adjusting the damper). I suspect this is due to my weight being on the high end for their stock tune. Plus, it has a climb mode to reduce its pedal bob. Then the happy day arrived when a box from Fox appeared on the doorstep. My previous bike was a 2013 Enduro 29 with an X2, so I had a good idea where to start with settings. They are actually quite close to Fox’s recommendations and utilize all volume reducers. On my first ride, the climb was an old switchbacking rocky double-track with a few sharp edges that tend to buck you off the saddle if suspension is too firm, yet it was buttery smooth. I actually checked to make sure the shock was in climb mode, which it was, and pedal bob was minimal. Upon starting the descent, my goals for switching to the X2 were immediately felt. Smaller, square edged bumps vanished and I could still push hard into the bike without hitting bottom. Squashing the bike through berms felt more fluid, rocketing out the far side. The remaining item on my to-do list is bracketing in the settings properly, which will only improve the already good performance. The new Specialized Enduro has features that are exciting and this X2 pairs exceptionally well. In case you cannot tell, I’m quite happy with it. Fox’s 3mm/6mm hex adjuster tool is super trick. As a bonus a compact 3mm/6mm hex adjuster tool is included with the new X2 shocks. It might seem odd to get excited about, since multi-tools have those hex sizes already. Yet, most cannot rotate fully without contacting the frame so they require multiple placements. This Fox tool lets you spin away and takes up minimal room. It’s a must-have for dialing in suspension (or for riders with an older X2 sans climb switch). Put the tiny hex key (provided by Fox for the air can screw) in your save-a-ride kit, because your multi-tool will not have one that small. When airing down the X2, don’t let the shock collapse beyond ~80% travel to allow the negative air spring to depressurize, otherwise it will fully compress. Leaving the shock on the bike simplifies this significantly. Also, make sure not to squeeze the air can too tightly, you don’t want to make it out-of-round. Author’s 2017 Enduro with Float X2, ready for the maiden voyage. FOX Float X2, 2016 (left) vs. 2017 (right) air can key, with retention screw on 2017. Great additional safety. FOX Float X2 volume spacers (orange) and spacer limiter (red). FOX 3mm/6mm hex adjuster tool, super trick. Hey John – awesome little write up! Did you ever run a coil on your previous E29? As a huge coil fan I would love for Push to come out with a tune for the 11/6 – however it seems like that it still a ways out. My STX just ran into some issues and I am thinking about replacing it with a X2. I know the X2 sure isn’t a coil but most folks do say its the next best thing. Can you agree? Yes, I ran the Ohlins coil on my previous enduro. It was pretty rad – could definitely feel the weight, yet small bumps disappeared. I definitely love the X2 though…prefer the air spring’s force curve over coil for this bike. We’re similar weights what was your base line settings? I’m thinking the same thing…2016 and the Ohlins STX has blown out and never could see that changing the setting had much effect, so I think I’ll change shocks rather than sending inthe Ohlins. BUT I do think Ohlins/specialzed should have recalled the shock. I hear that they have a fix for the leak but it was a defect no normal wear and tear.